Quiet as she may seem, when she revealed she got engaged (!) last Friday (! ), it was hard for her to hide how happy she was. You know that glowing happiness that people talk about? Seeing it in person is really something to behold. It’s downright infectious. It warms the insides. 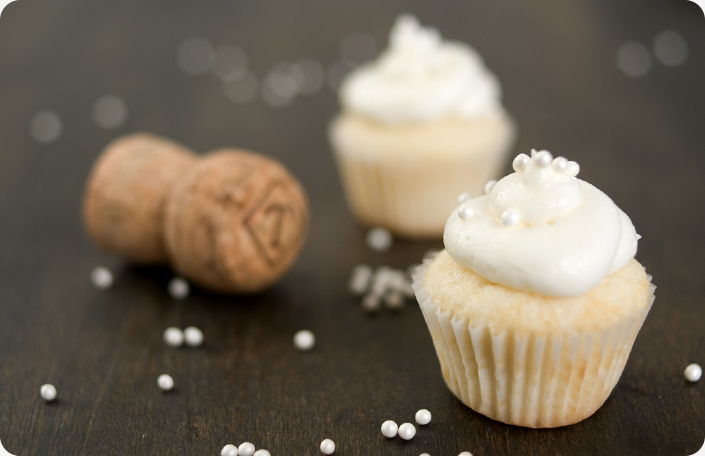 She wanted to make Champagne Cupcakes to celebrate. They were good. Very good. Frothy. Resplendent with butter. Almost too pretty to eat. And I doubled over laughing when I saw where she had gotten those little candy pearls- from a Disney Princess candy kit that included tiny glass slippers and tiaras. As soon as we frosted them, I could not wait for her photos. And like these cupcakes, they do not disappoint. The ring’s pretty too. The recipe came our way via Gimme Some Oven. Ali’s blog is lovely and her recipes are extremely accessible. She, in turn, sourced and adapted this recipe from AllRecipes. There now- everyone accounted for? Good. To celebrate, it takes a village. I was looking at Foodgawker and saw your pretty pics. Low and behold this was my recipe from Allrecipes from many years ago LOL. I’m so happy you enjoyed them! That’s crazy! They were delicious, Krissy. Adding you to my Thank You Note list. wow, these look almost too good to eat! perfect for any celebration! Yummy! Thanks Judi … and congratulations Nicole, the ring is gorgeous! Yum! Congrats Nicole and what a gorgeous ring too! Inspector Gnocchi & The Case of the Missing Case | Some Kitchen Stories Inspector Gnocchi & The Case of the Missing Case | 1 Photographer. 1 Writer. This is Our Food Blog. Congratulations… Who makes the ring? It’s gorgeous! Very antique looking. Very cool…. I look at antique rings all the time when we can find shops that sell estate jewelry. A lot of it is big and looks tacky (at least on my size 4 finger!). Your’s is lovely though…. Congrats! And tell your future hubby “great job”!!! thanks! 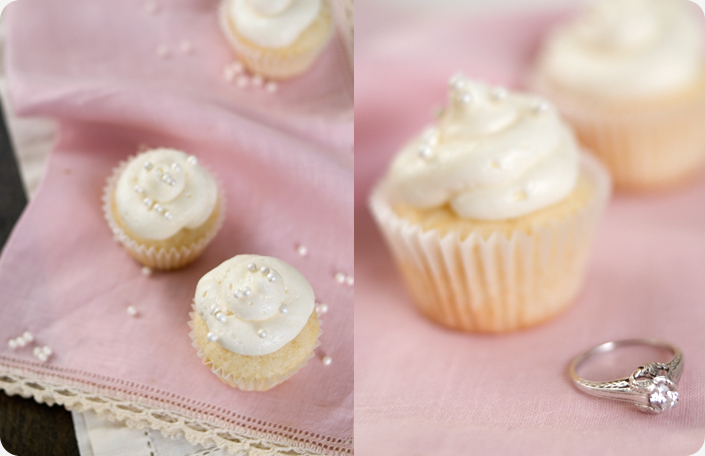 The cupcakes are sweet and delicious – the icing is sweet, but fluffy and smooth and not sugary if that makes any sense. They’ve been a hit every time I’ve made them! Just made these for tonight! What better way to ring in 2012!! Hopefully some ladies I know will get in engaged this coming year and I can make them for that occassion! Congrats to you & Happy New Year! P.s. I uses moscato d’asti in mine.